Have you ever had one of those moments in your life that was so spectacular, you thought you must have been dreaming? Well, HB and I had one such experience while visiting beautiful Vancouver Island, British Columbia. We were staying at the historic Empress Hotel and on a whim decided we’d take a whale watching trip. The tour company explained that we may not even see a whale, but if we were really fortunate, one might just be breaching (that’s when a whale comes to the surface in almost a dancing jump). There are several pods of orcas in the area. They nickname them by letters… there’s the “J” pod and the “K” pod… you get the idea. 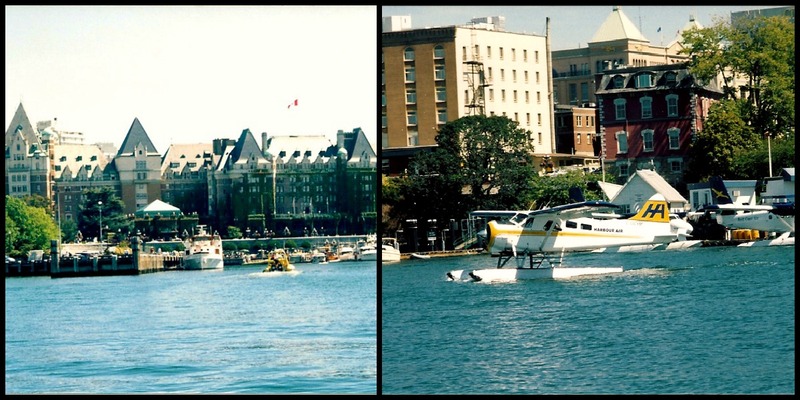 Anyway, we were excited to see a seaplane taking off as we were leaving Victoria Harbour; it was quite close to our rubber pontoon boat known as an inflatable rigid Zodiac. The guide was very knowledgeable as we peppered him with questions. 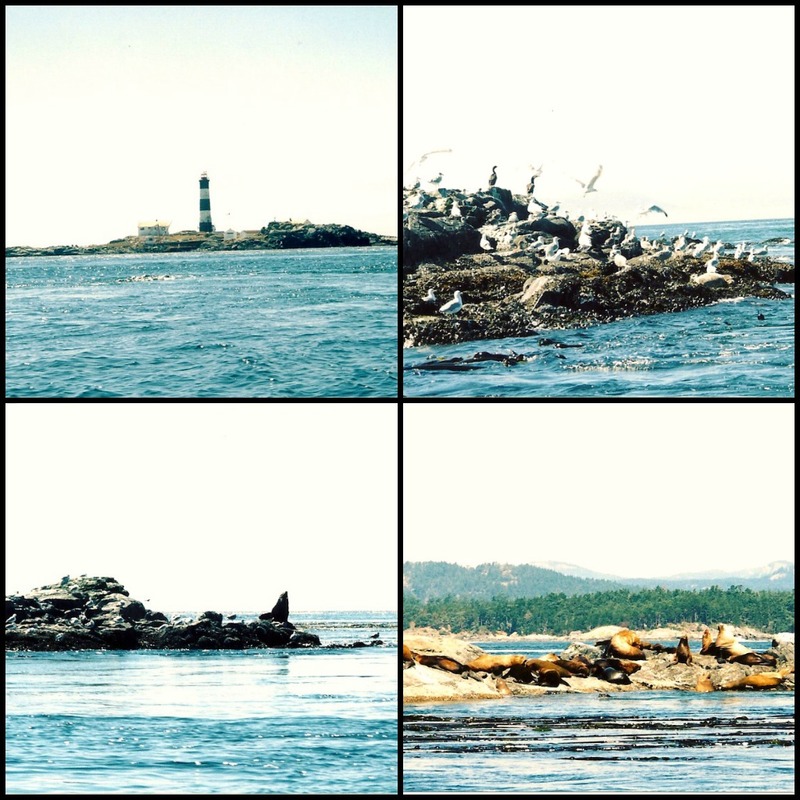 He took us to several of the popular sights… one was this lighthouse on an island filled with elephant seals and other wild life. We were content. Still no whale sightings. 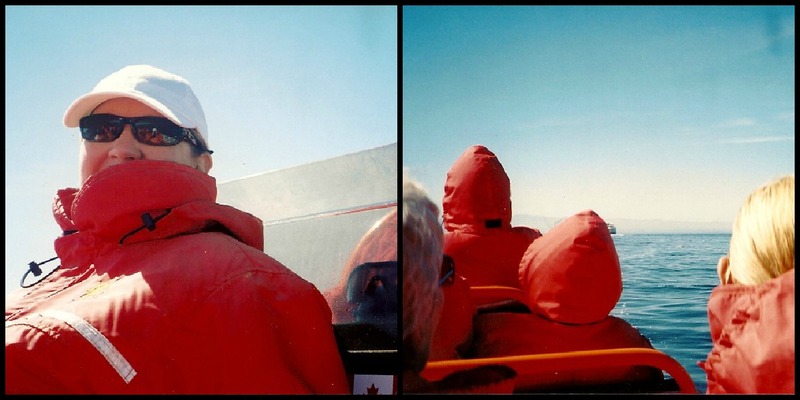 It was getting cold and we were glad to be in our very large but comfortably warm suits that had built-in life jackets. Yes, they were bulky, but we didn’t care. We were perfectly happy on a beautiful Canadian day! Words can’t properly explain the next few moments. We suddenly saw an orca pod that seemed to be moving parallel to us at a very safe distance from our boat. After all, our boat was not that large. There were about eleven passengers, including us and the captain/guide who sat directly behind HB and me. When you’re out in the wild, you are at the mercy of the elements and the wildlife. A typical pod of orcas consists of between 20 and 40 individuals, headed by an alpha male. Orcas (aka killer whales) can grow up to 32 feet and weight up to 10 tons. 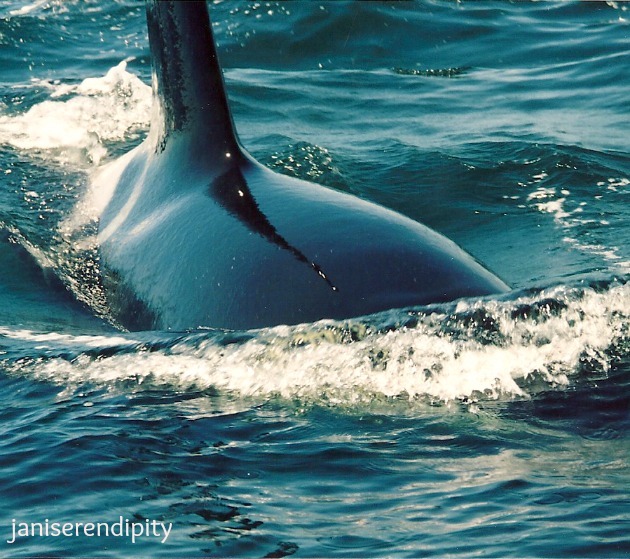 The dorsal fin of the male orca in the “K” pod is six feet tall. With stunning abruptness this entire pod changed direction and were headed directly toward our small vessel. The captain turned off the motor because it was too late to move the boat. He told us to hold on and be very still. The male orca was upon us before we even knew what was happening. This mighty creature was magnificent. In those brief seconds as he surfaced right next to our boat I am certain my heart skipped a beat, HB took this photo… it is not blown up… this is exactly how close he was to our boat. I can’t tell you how large a wake he left other than that we all held on for dear life! 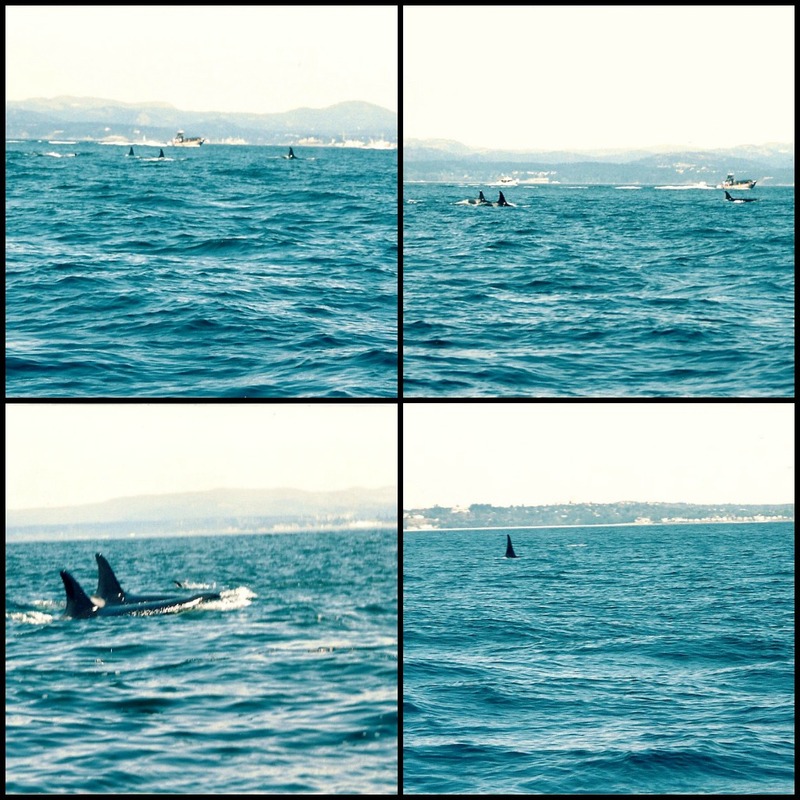 After we watched him swim away, each person in that boat knew we had just witnessed something extraordinary… so dangerous, yet exhilarating – all at the same time! I can’t promise that you’ll be fortunate enough to experience something quite like this, if you do visit Victoria and decide to go on a whale watching adventure. But I can tell you that we would still have thoroughly enjoyed the trip had this incredible moment not happened. We would highly recommend this to any traveler who is visiting Vancouver Island and enjoying the unique flavor of the Canadian West Coast. I would love to hear about any unforgettable experiences you may have had in your travels – or for that matter, any comments would be welcome! HB was raised in a tiny berg in southern Alberta. He was born in Taber, but grew up in Barnwell, a hamlet of about 250. 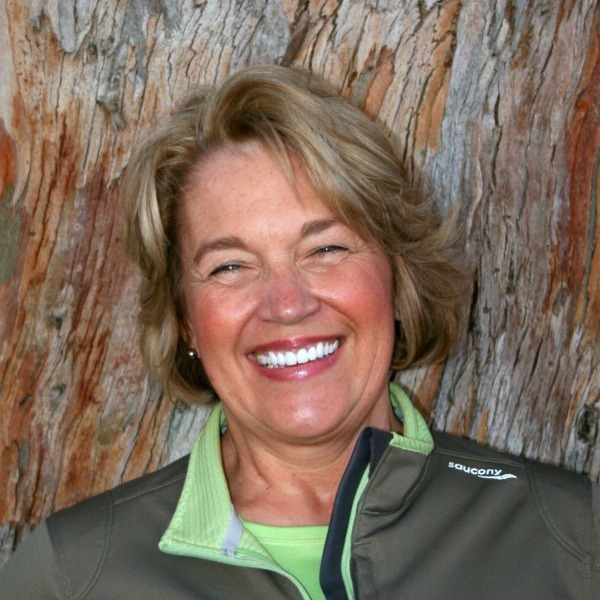 Everyone knew everyone – and it was a very tight community. If you ever want to learn more about your life’s partner, simply visit their old homestead. 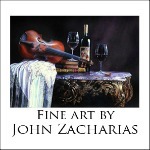 It brings a much clearer image of what life must have been like. 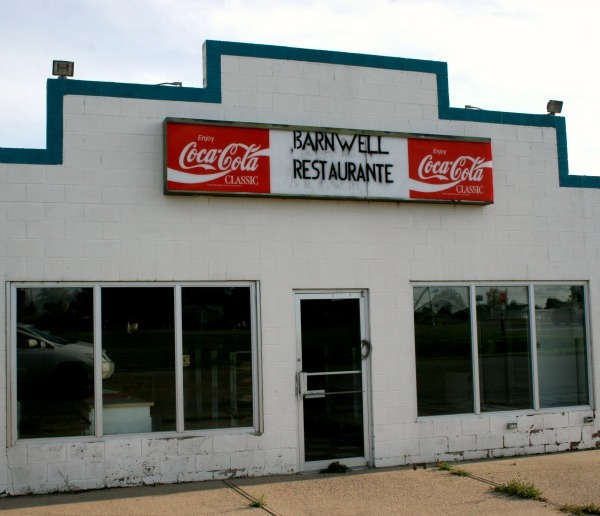 In the case of Barnwell (as bucolic and rustic as it sounds)… well, the land is flat, and very cold in the winter- pretty much in the middle of nowhere. 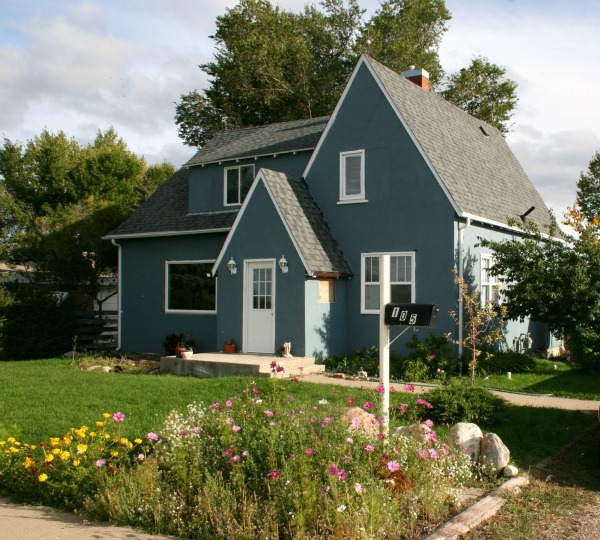 But, I immediately fell in love with this place… this childhood home of my sweetheart. The home his father built, in the early forties, is still standing today… albeit quite different in color! It’s difficult to even imagine that HB was the youngest of ten children and that they did not have plumbing for the first few years of his life. Back in the day, plumbing just didn’t exist in the middle of nowhere! The province built a highway straight through, bypassing HB’s Barnwell. So when we recently visited it, we were saddened to see his favorite country store and soda shop closed… all in the name of development! I remember how lively this place was when we first visited Barnwell in 1990. Now it just looks like a deserted shell! 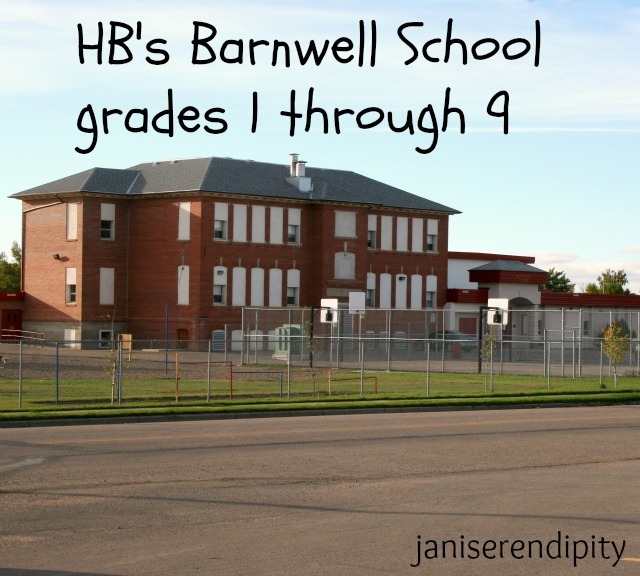 HB’s grade school and middle school still stands. I was happy to see that! In Canada it’s always called grade one… versus how we refer to it in the States… first grade! So until I met HB, I didn’t really know what a coulee was, let alone how to spell it. I’m gonna let him tell you about his memories of coulees. 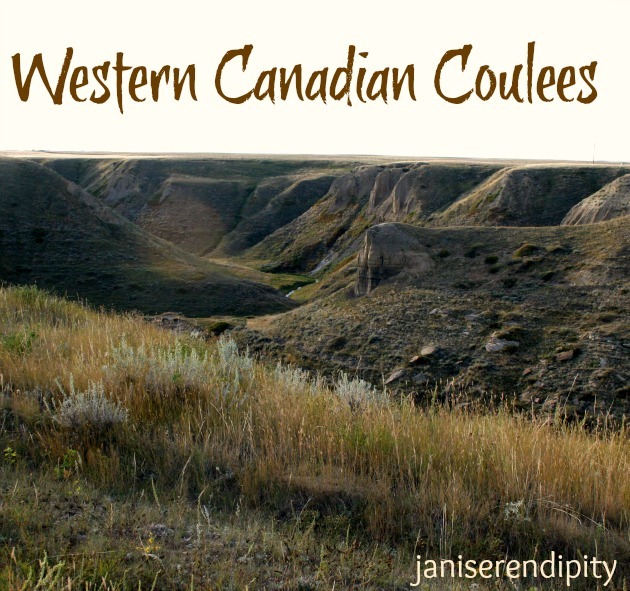 “The word coulee is enigmatic to many Americans, even those living in the West where such visual delights of nature proliferate. The word may be a bit more understandable if substituted by “hollow”, which for unknown reasons is the term preferred south of the 49th parallel. By definition, a coulee (from a similar French word) is a natural depression caused by water erosion – but very recognizable due to its undulating nature. Typically there will be a river or small tributary running through the coulee. Being raised in southern Alberta, where the prairie lands are extremely flat, coulees create a distinctive break in the landscape, existing in stark contrast to the level countryside. In many locations coulees provide shelter for deer and other wildlife, and are often replete with deciduous cover and several kinds of edible berries. As a boy, I trekked many miles through the coulees that run a short distance from the rural community where I was raised. There was a tantalizing assortment of elements that served as diversions to a boy… among them firepits and artifacts such as arrowheads from uncounted generations of Native Americans that had pitched their campsites there. A boy could take his .22 rifle to the coulees and, with no humans for miles, plink cans at the garbage dump site, or the ubiquitous gophers popping up out of their holes. Oldman River (pronounced “old man”)… that’s honestly the name of it. HB gave a low chuckle as he first laid eyes upon this favorite childhood memory. 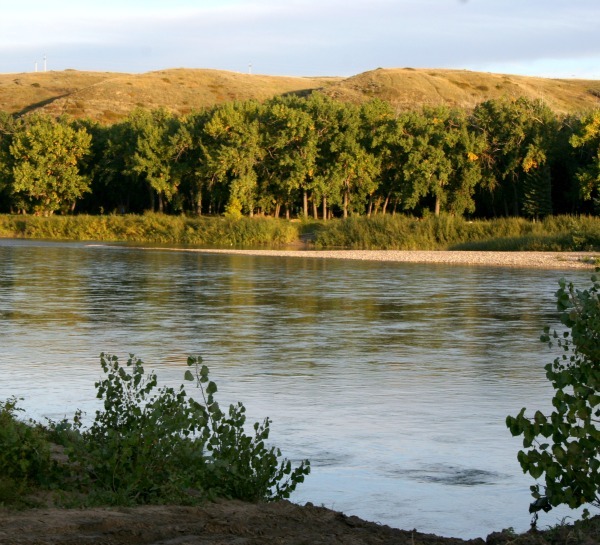 He always told me about “Oldman River” – but it was quite another experience to actually step on its bank and watch in wonder as deer grazed just around the bend – a quiet, serene and perfect place to be together. This was quite a reflective trip for my husband. It gave me a greater appreciation and understanding of him. Funny, after all these almost thirty years together, I still find new insights to the man I love. I would recommend a trip like this to anyone in a relationship that they would like to nurture. HB and I can’t go back to my childhood home because it’s now a bustling strip mall. When I grew up, there was nothing but fields to graze our horses in and wide open spaces for wonderful imaginative games to while away our afternoons. Have you ever visited your partner’s hometown and walked where he or she walked as a child? Be prepared to ask lots of questions. It will spark memories… some good, some not so good. But in either case it can become very cathartic and beneficial to you both! 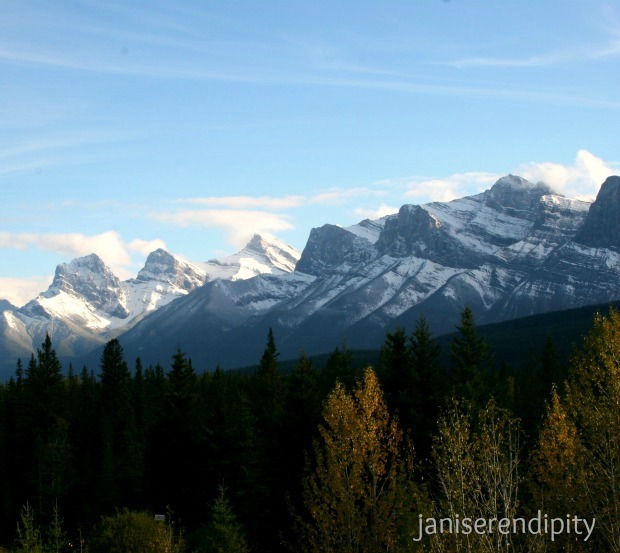 We love Alberta – and especially Banff National Park! In October the trees are in full fall plumage. It can be a bright sunny, beautiful fall day – and the next, everything is covered in a glistening sheen of freshly fallen snow. We were fortunate enough to experience the beauty of such a sudden change. 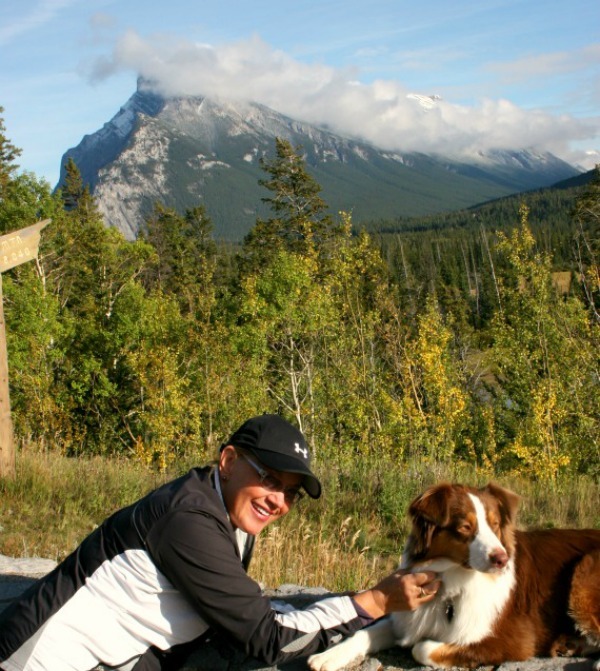 In planning our trip through western Canada, it was important to 1) find pet friendly hotels, and 2) they had to have a good lap pool, as I was in training for several swim events for the upcoming Huntsman Senior Games. 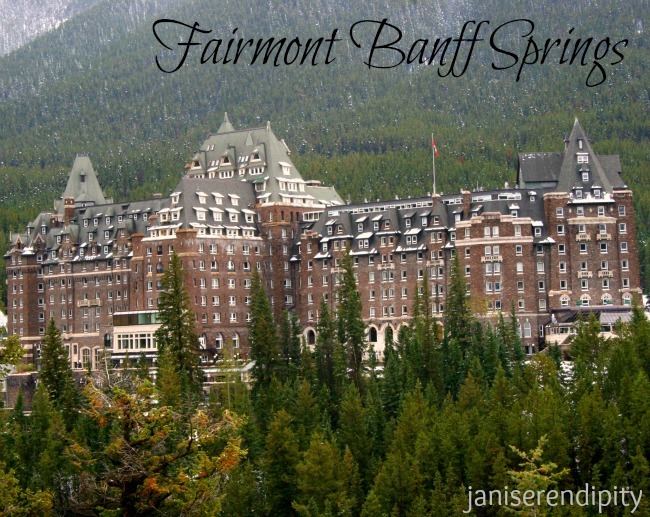 The Fairmont Banff Springs Hotel is a fabulous place to stay and it fit our criteria perfectly. We stayed on the Fairmont Gold level, which provided a lovely continental breakfast and evening hors ‘d oeuvres. During our stay, the hors ‘d oeuvres were substantial enough, in fact, that we considered it our dinner meal. On my favorite evening we enjoyed miniature filet of beef wellington. It was definitely worth reserving that level. The 50 meter indoor pool is fabulous.In the below photo, I’m on the far end, preparing for my competition dive and lap swim. 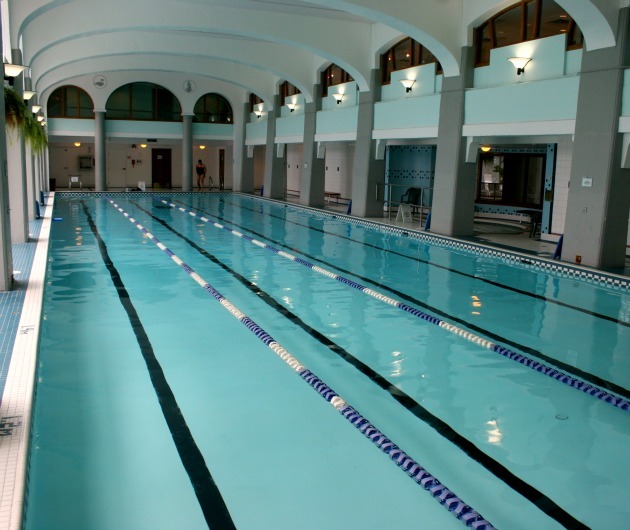 The day after the snowfall, I had a great workout and decided to take a relaxing swim in the outdoor heated pool. As I ran through the snow and jumped in, I realized that on the other end was a magnificent buck nibbling on the leaves of a nearby tree. What a surreal setting to be surrounded by the warm fog streaming from the heat of the pool amid the quiet serenity of observing this eight pointer just a few feet away. He was perfectly content with my studying him and it was a moment I will never forget. Of course I wouldn’t have had my camera handy, but that sublime image is forever fixed in my memory! When you travel to Banff, don’t just stay in town shopping at all the classic boutiques, although there is a shop for everyone. 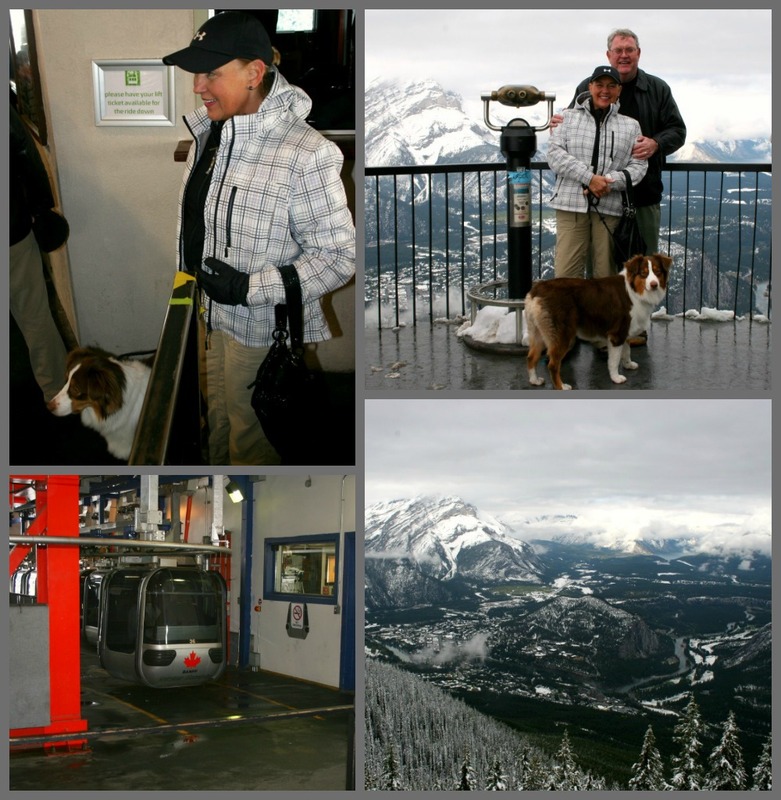 Just a short five minute drive from the town of Banff is the Banff Gondola. You will climb 698m (2,292 ft) to an elevation of 2,281m (7,486 ft) in a completely covered four passenger gondola; this involves an eight minute ride to the Summit Upper Terminal. The views are absolutely breathtaking! An added bonus… our sweet Australian shepherd, Emmy, joined us. It was quite entertaining, as several tourists from different countries asked if they could take a photo of our dog. We’re standing on top of this magnificent view – and they wanted a photo of Emmy! There is a picture perfect view at every corner driving through the grandeur of the Canadian Rockies! Truly, words can’t express this nature’s wonderland. It is a trip we will never forget! 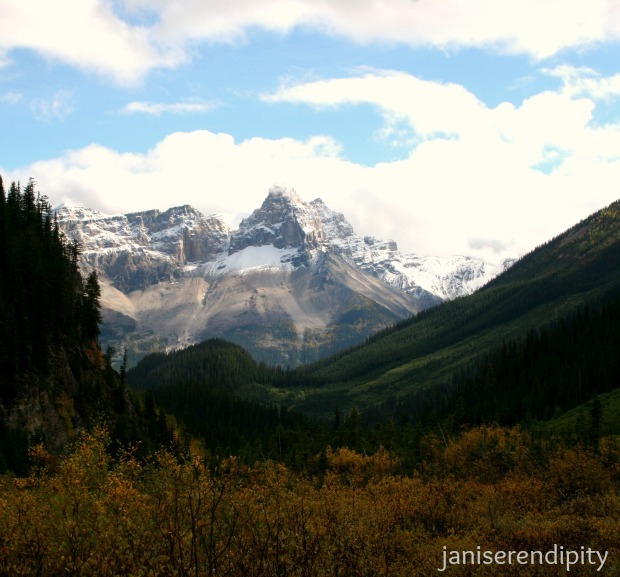 Have you traveled to Banff National Park? It should definitely be on your bucket list! 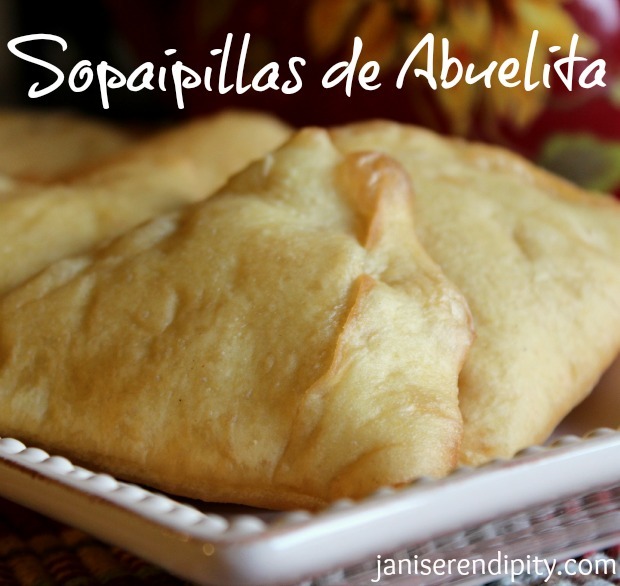 When we were in Santa Fe, we had the best sopaipillas – translated, “sopa” for soup, “pillas” for pillows. They are so tasty with just plain honey – but most Santa Feans pour Christmas chile sauce in the sopas (as they are locally called) followed by the honey for just the right blend of picante and sweetness. While in Santa Fe, we met the most delightful woman, Elice, at La Choza restaurant. She sat down and gave us a lengthy tutorial on Santa Feans and their pride in the chile sauces that have been passed down through many generations. They refer to themselves as “chile snobs”… I now know why! Here is her great grandma Pelagia’s (I’m calling her Abuelita or little grandma) recipe for sopas along with a recipe for red chile with or without meat. Heat oil, add flour slowly – stirring rapidly with a wisk, until it just begins to brown. Immediately add chile powder and garlic, still stirring rapidly. When garlic and chile become aromatic, slowly add water – still continually stirring. When all ingredients are well incorporated and smooth, bring to a boil and lower to a low simmer. At this point you may wish to adjust spices or consistency to taste. Covering the pan is optional; continue to periodically stir as it simmers for about one-half hour. Use the same ingredients listed above, plus one pound lean ground beef or thinly cut pork. Brown the meat in oil; reduce oil 1/8 cup. When browned, add the flour; continue to follow the recipe as above. Again, you may wish to adjust spices and/or water to bring to desired consistency. Sift all dry ingredients. Cut in the shortening to be as evenly distributed as possible. Add the water to make a dough (the dough will not be as crumbly as pie dough, but should be very tender. If time allows, cover and let stand for 1 to 2 hours. While the dough sits, begin heating the oil. Form the dough into a rectangle, about 1/8″ thickness. Cut into smaller rectangles, three by four inches. Slip gently in to the hot oil; which should start bubbling immediately. 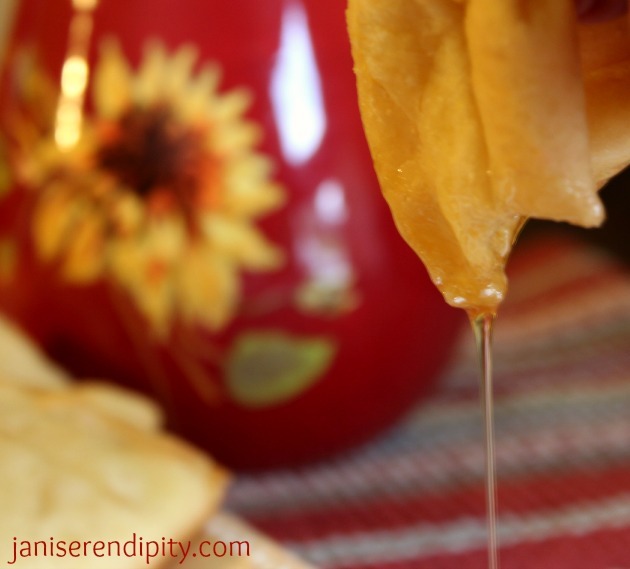 Fry each sopaipilla to a golden, puffy brown; turn over once. Approximate cooking time is one minute. 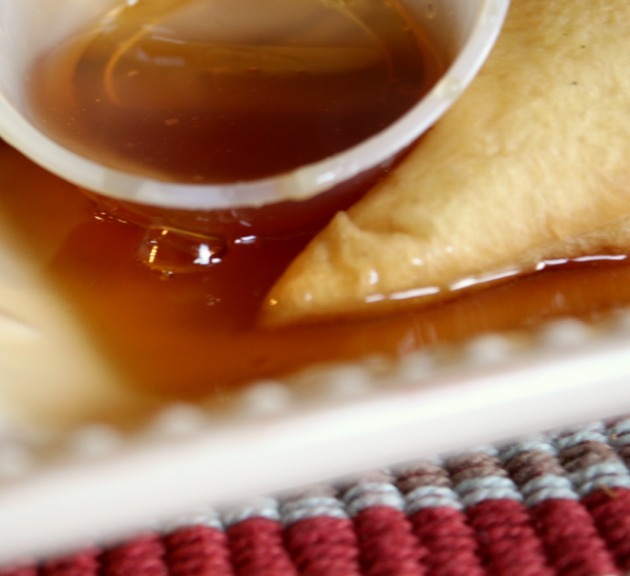 We just served our sopaipillas with dripping honey… a huge YUM! We are excited to try this red chile sauce. It will be picante – and we love picante, so it’s all good. 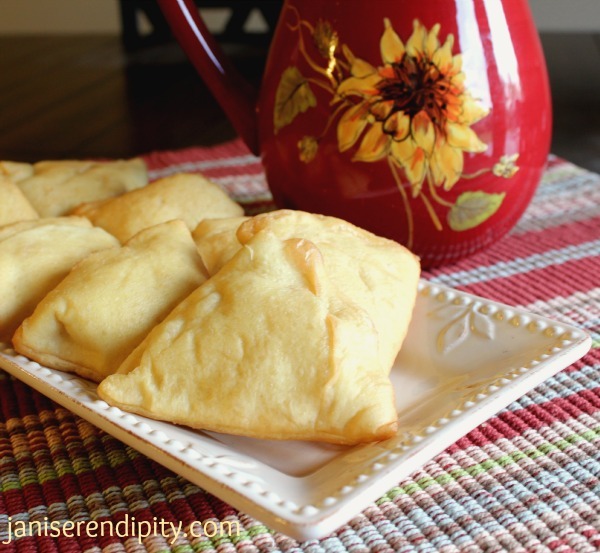 I decided to include the chile recipes as I already know just how great they are!